Theatrical history in Richmond goes back at least as far as 1595, when Shakespeare would have performed at Richmond Palace, residence of Queen Elizabeth I. There are reports of several theatrical enterprises on Richmond Hill in the early 18th Century. Our guide referred to Nathaniel Rawlings, who opened a venue in 1714 and Thomas Chapman in 1719. 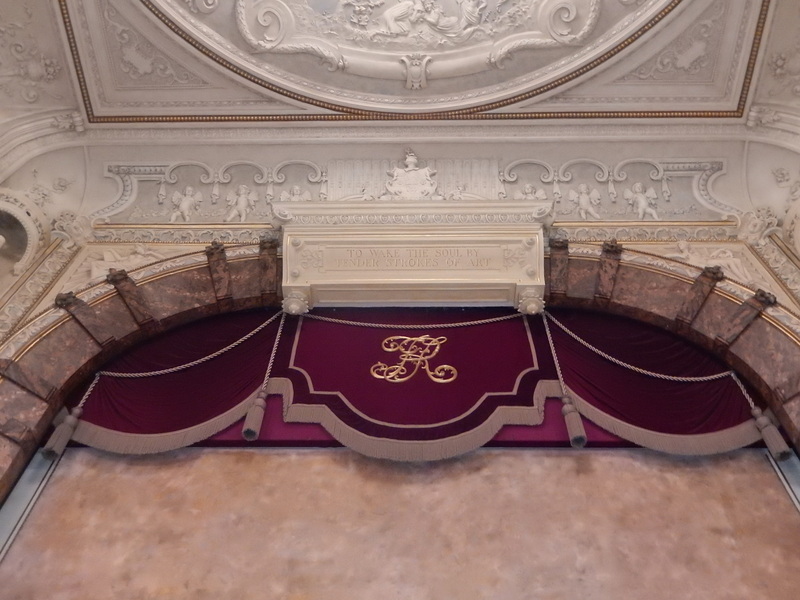 The Richmond Theatre’s history also refers to William Penkethman, who opened a theatre on Richmond Hill in 1718. In 1765 a new theatre – the New Theatre, in fact – is constructed on the Green, close to the home of the current venue. Charles Dickens and the actor-manager David Garrick performed there. Edmund Keane was actor-manager of the New Theatre and is buried at St Mary Magdalen Church nearby. Two plaques of Keane are situated in the foyer of the Richmond Theatre – despite Keane having died over half a century before its construction. MC Mouflet, local businessman and owner of the Greyhound & Castle Hotel, opened a theatre in the Assembly Rooms, with Lillie Lagntry reading the prologue. The commercial success of the Assembly Rooms led Mouflet to purchase land on Richmond Green and begin construction of the Richmond Theatre. Mouflet constructed the Richmond Theatre in grand style and at great expense. The cost of construction was £30,000, a huge sum when compared to the typical cost of £18-25,000 for venues of similar size elsewhere. In today’s money, this would equate to £2.8 million, indicating how construction inflation has outstripped general inflation: it is inconceivable that such a venue could be constructed now for less than ten times that amount. 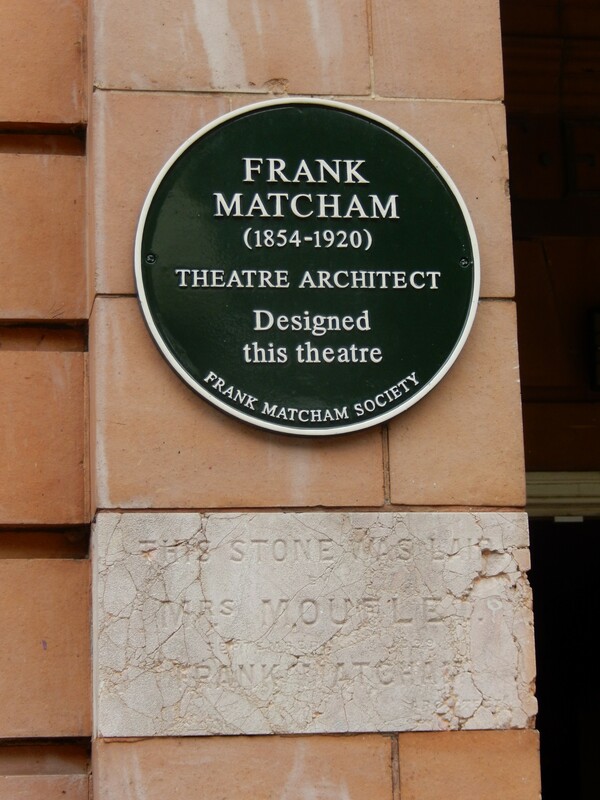 Mouflet was eager to construct rapidly and employed the services of the foremost theatrical architect of the day, Frank Matcham. Matcham was famous for the quality of his work (including pioneering the use of cantilevering, thus eliminating sight-restricting pillars), the imaginative and outlandish designs (with themes such as Moorish palaces for his Alhambra) as well as his productivity. 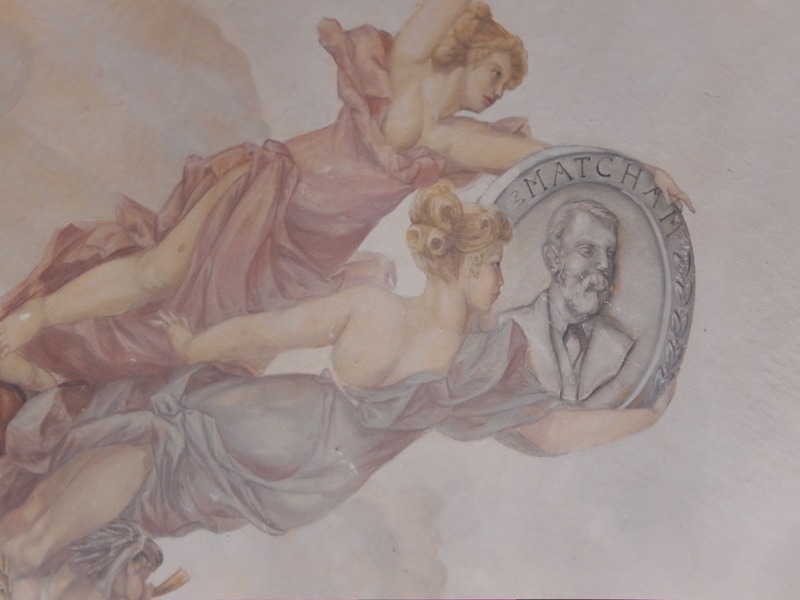 Matcham was unparalleled in his ability to turn out high-quality work in double-quick time. 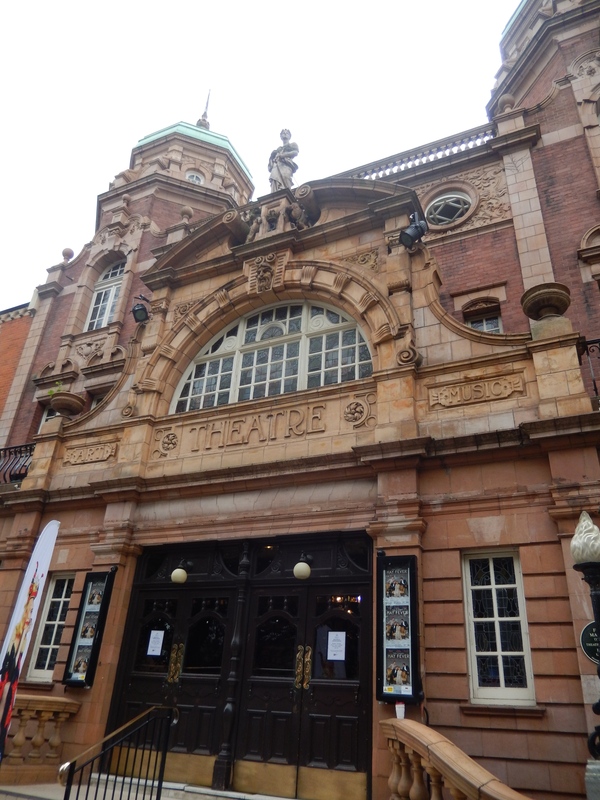 The Foundation Stone was laid on 14 Sep 1898 and the theatre opened just 369 days later on 18 Sep 1899, with a production of As You Like It. 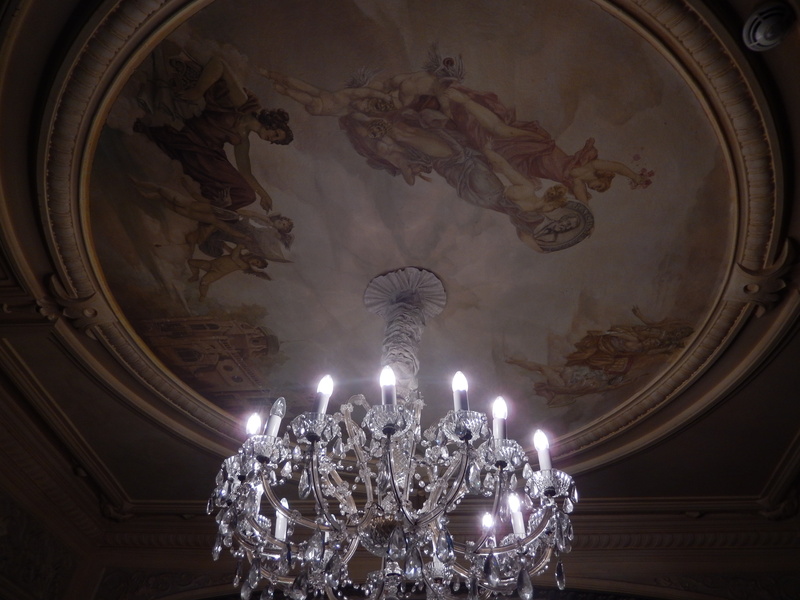 Inside the foyer, we find a remarkable ceiling frieze, far less old than it looks. It was added in 1989-91, during a major refurbishment and was painted by TV’s Laurence Llewelyn-Bowen. 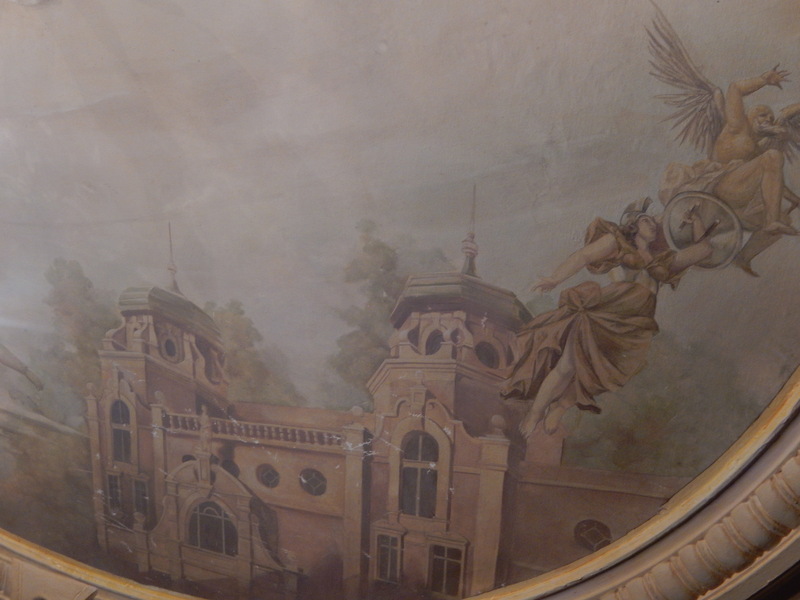 It honours Matcham and shows Father Time being banished from the theatre, as well as a depiction of Richmond welcoming the theatre. The lavishness of the construction is clearly visible in the foyer, with extensive use of marble and solid mahogany, which would be too expensive for any new venue today. Moving into the auditorium, which seated 1,246 originally, but only 840 today, the beauty of the theatre is striking. Indeed, it has featured in numerous films and TV programmes, including Mr Selfridge, Poirot, Evita and Wilde, starring Stephen Fry. 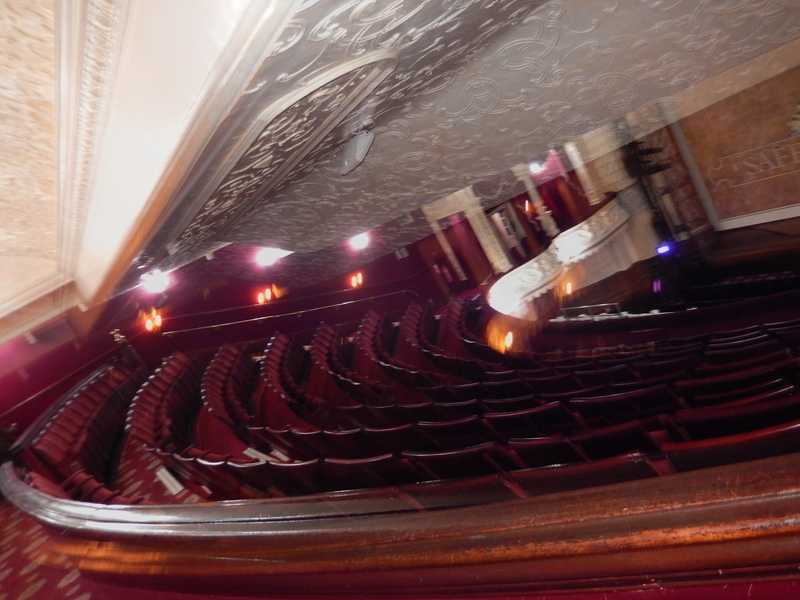 It has doubled for the original D’Oyly Carte in Topsy Turvy, Ford’s theatre in Washington DC for National Treasure; Book of Secrets, The Kray brothers’ nightclub in The Krays, and as the Duke of York’s Theatre for the premiere of Peter Pan in Finding Neverland with Johnny Depp. The ceiling features reliefs of four of Shakespeare’s most popular works: Romeo & Juliet, King Lear, Hamlet and A Midsummer Night’s Dream. In keeping with theatrical superstition, Macbeth does not feature! 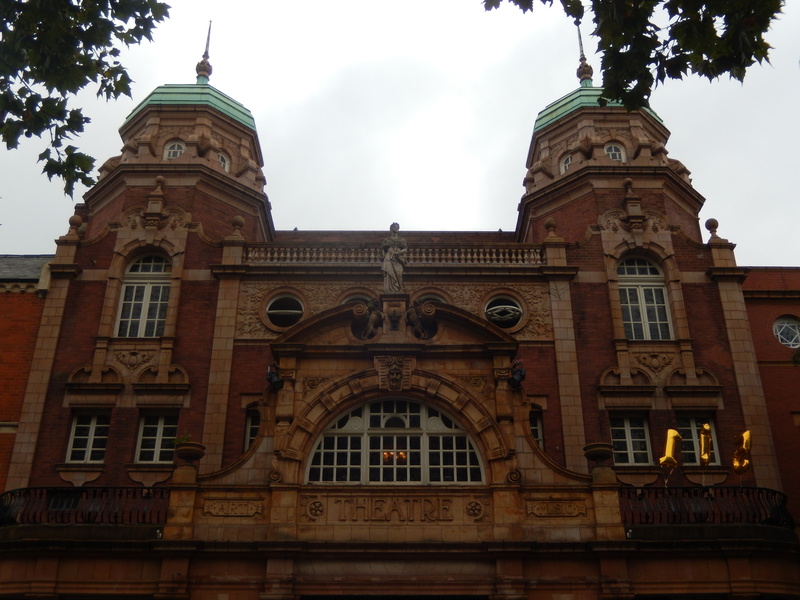 Whilst the Richmond Theatre is capable of hosting musicals, it more typically hosts plays. 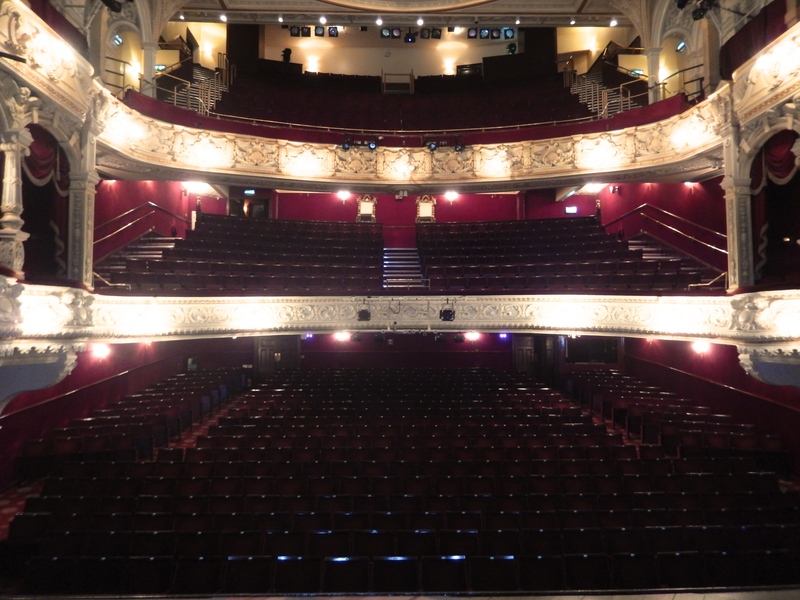 In order to optimise sight lines and asset utilisation, it features a liftable orchestra pit, allowing two extra rows of seating when not needed, but also allowing a full orchestra pit for musical productions, including the theatre’s famous pantomimes. 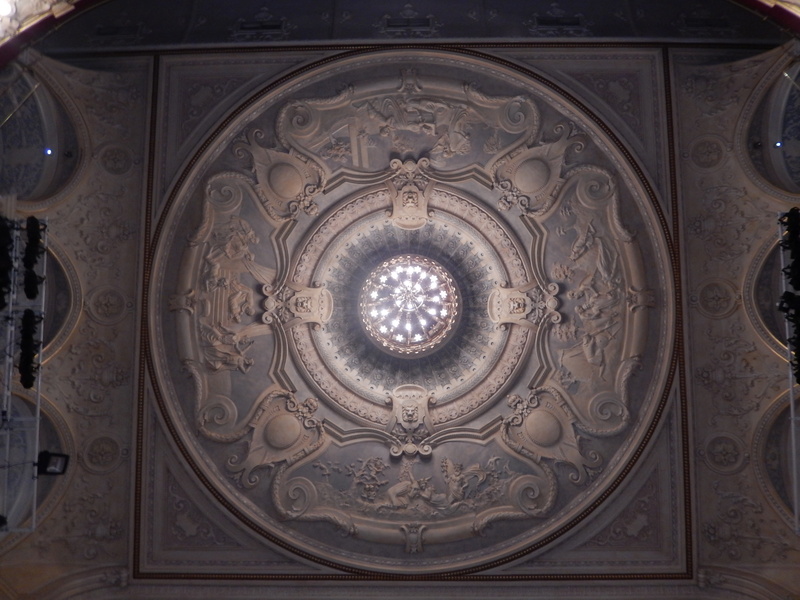 The theatre was lit by electricity from its opening night, using a steam generator for the first four years of operation, until being added to the grid in 1903. The use of electricity ensured a reduced risk of fire, compared to gas, in an era when fires in theatres were frequent. 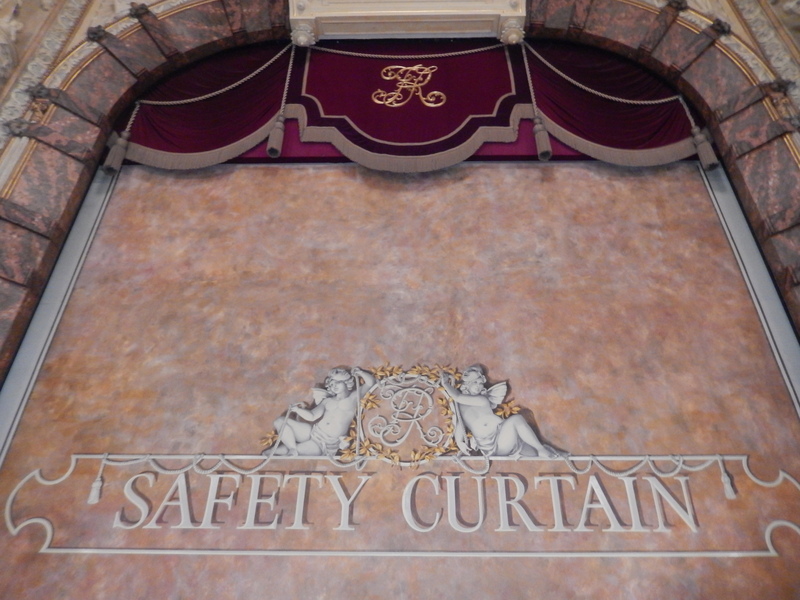 The current safety curtain, lowered before each performance and until the first twelve audience members have entered the auditorium (in a strange requirement of the local authorities), weighs an impressive four tonnes and replaced the previous ‘iron’, which had been constructed of asbestos. 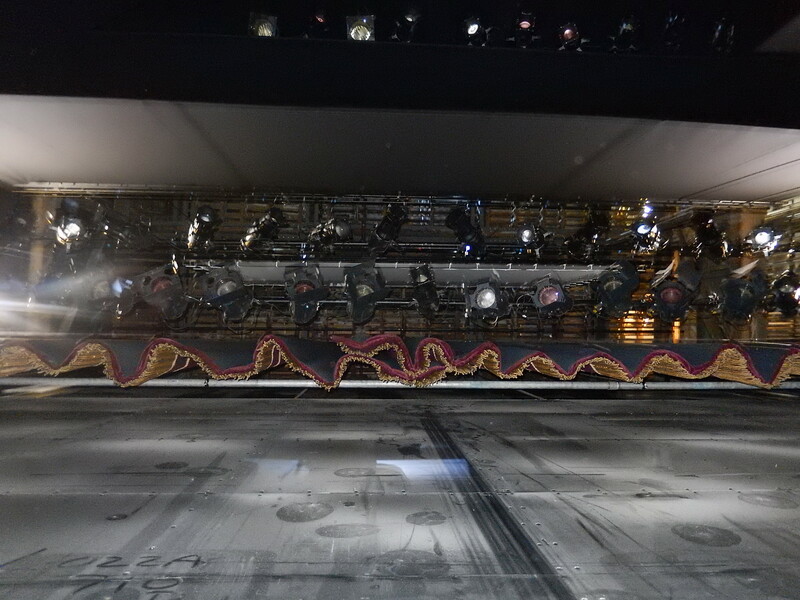 The stage itself is 27’8″ wide and, at 31′ deep, one of the deepest stages for a theatre of comparable size. The stage is raked, which while good for sight lines, has become unfashionable for touring theatre productions due to the complexity of aligning pieces of the set in box-set form. The acoustics of the auditorium are fantastic, with plaster absorbing ‘bad noise’ but with very few right angles, reflecting sound to carry to the very back of the auditorium. 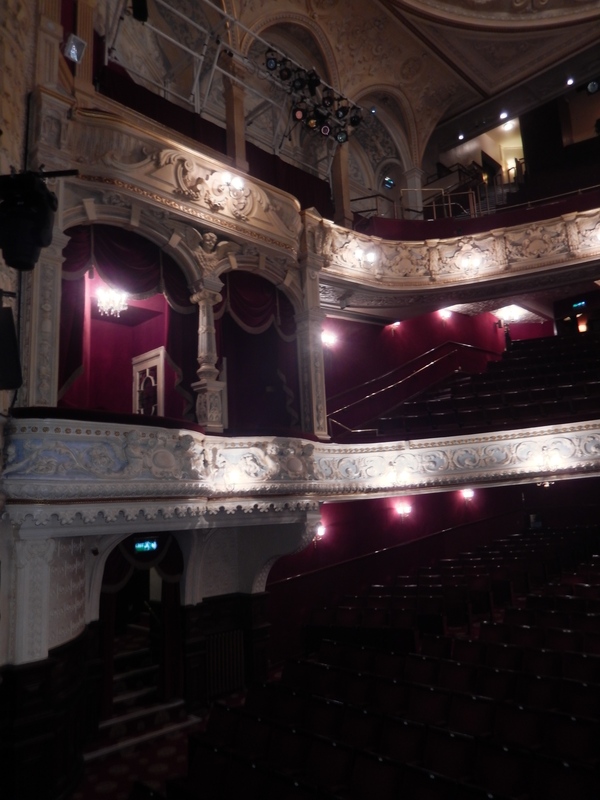 Undoubtedly a jewel of Britain’s theatrical history and one of the finest remaining examples of Frank Matcham’s theatres. It recently celebrated it’s 115th birthday. 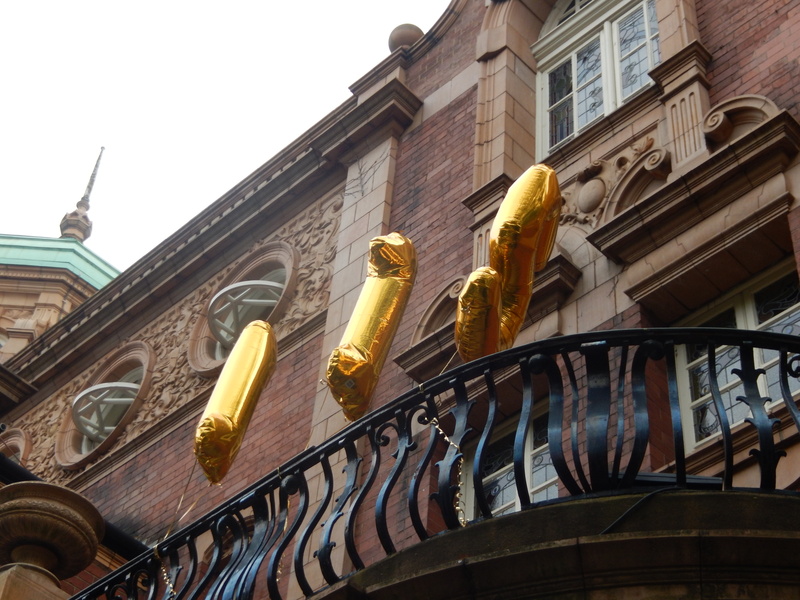 Happy Birthday, Richmond Theatre! Photos: all copyright Showbusinessinsights 2014. This entry was posted in Theatre and tagged architect, David Garrick, Edmund Keane, evita, Finding Neverland, frank matcham, Mouflet, Mr Selfridge, National Treasure Book Of Secrets, Open House, Open House London, Openhouse, pantomime, Peter Pan, Poirot, Richmond, Richmond Theatre, The Krays, theatre, Wilde by showbusinessinsights. Bookmark the permalink.